Today I share an activity very similar to the last one. It consists of using micro:bit and Scratch to play computationally with a work of art (it could be from a museum or also public art). In this particular case we play with the works "Golconda" by René Magritte from The Menil Collection (Houston) and "The Treachery of Images" also by Magritte, on display at the Los Angeles County Museum of Art (LACMA). Golconda, René Magritte (1953) and The Treachery of Images, René Magritte (1929). Magritte is an artist that children like very much (they like all surrealists) because of his ability to unsettle you and make you wonder what you're seeing. After exploring his works with the children (either in a museum or on the Internet), you can let them choose a couple of them and think about how to create an interaction between a physical work (on paper, cardboard, etc.) and a virtual work (on the screen). In my example, as you can see in the video above, the idea is that by rotating physically the painting of the pipe we can animate the digital Golconda painting, creating the effect of raining men (up and down), and if we shake the pipe we turn the men into pipes. The programming of the effects is quite simple, but we use many sprites and also clones, so it's probably an activity for kids aged 12 and up. The materials we need are: the micro:bit board, a computer or tablet with an Internet connection, a device that can take pictures, and some graphic editing software (although with the Scratch editor can be enough). In my example, one painting is on the screen and the other is printed, but the activity would be even better if the children draw or paint their own works (inspired by Magritte or by others). 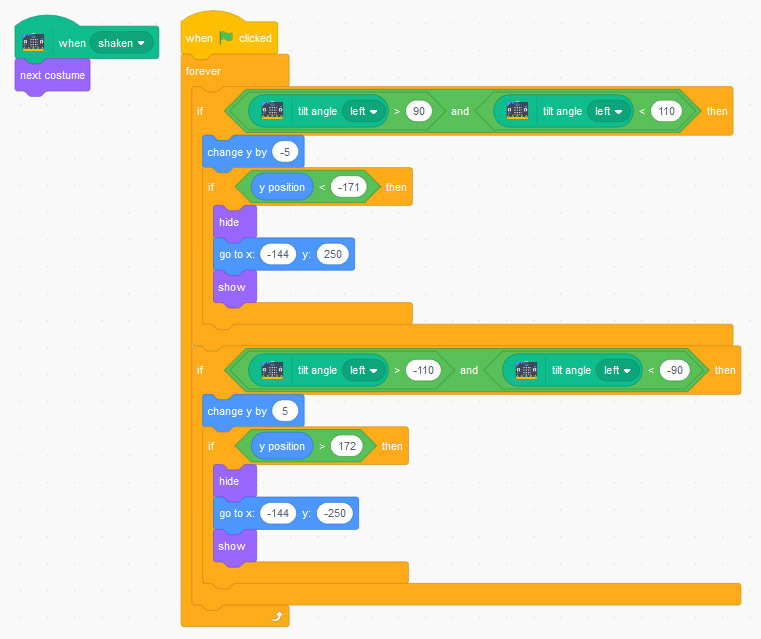 To use micro:bit from Scratch we must install ScratchLink and add the micro:bit extension inside our project (more info here). The most laborious part of the activity would be to cut out the men from the painting, but luckily I found that a digital design studio (commoners) created the same animation, so I used their cutouts. Another arduous task if we work with the painting Golconda is to place all the sprites in the same positions as in the real artwork, also taking into account that they are in different layers. Getting the characters and placing them in their initial positions are the only two tricky tasks of this project. Like I said, the Scratch programming is simple. It is based on using the micro:bit extension to detect the tilt angle of the board (which is attached behind the printed paint). Depending on the tilt angle we then make the men move up or down. And if we detect a shake, then we change the costume of all sprites (from man to pipe, or vice versa). You can check my Scratch project and the scripts here (feel free to remix!). Main scripts. The angle will depend on how you place the micro:bit. Positions will be different for each sprite. You could try a similar project but with your own physical and virtual artworks instead of using paintings by Magritte. Or you could build a small museum room with cardboard and colors, and create interactions between the virtual room and the cardboard room. If you want to be inspired by other projects that can be done with micro:bit you can take a look at these ideas.